Tim Tonachella’s voice is unmistakable. I’ve learned its texture, its subtle turns and the meaning behind the sounds. It’s got some gravel in it; it throws stones playfully. Over several phone calls with the Michigan photographer this past year, though, when we talked about his life, his approach and his raw, explorative photography – the main thing ringing in my ears was that he didn’t want the first bullet point to be that he’s blind. We talked a lot about how describing things affects how they’re perceived, and my intention was not to congratulate him for being the first legally blind guy to pick up a camera (he’s not, in case you’re wondering). I reached out to ask if we could use his work in an exercise to help explore the process and practicalities of describing artwork for a blind audience. He was kind enough to say yes, and today we’re able to present never-before-seen photos along with a conversational, round-table audio description from a few folks who have spent time at the intersection of blindness and visual art: UC Berkeley professor Georgina Kleege, SFMOMA curator Peter Samis and San Francisco photographer Troy Holden. Before we dive into the audio, a bit more about Tim Tonachella. He came to photography later in life, and when he first picked up the camera, everyone seemed to scratch their heads. He had gone to the Michigan School for the Blind with the likes of musician Stevie Wonder and our own Enchanted Hills Camp Construction Manager George Wurtzel, and though he still wryly jokes that he “never really liked blind people” much, his legal blindness was a constant throughout his life. When he picked up the camera in his fifties though, he suddenly had access to new worlds. The telephoto lens wasn’t, as many might assume, a confounding tool only for use by sighted folks, but instead opened up environments and enhanced his ability to see much in the way it would for those who clock in at 20/20 on the eye chart. On January 27, Tonachella’s show “Growing Old On the Street” opens at the Downriver Council for the Arts in Wyandotte, MI. The collection is full of portraits, candid and posed, that reflect the toughness of Tonachella’s human fabric. The show, which also showcases the interpretative works of dozens of other artists, reflects Tonachella’s core sensibilities: generous, honest and a bit rough around the edges. Tonachella’s process is a labor of love, and often involves sitting patiently to hear the stories and take in the realities of the quietly persevering souls that cities have left behind. Listen to the whole discussion in the playlist above or click each image to be directed to its associated Soundcloud link. Find out more about Tim Tonachella’s upcoming shows at the end of this post. Photograph 1: A man sits on a concrete ledge and leans his weight into wrought iron fence from BeitzellFence.com. His wears a bucket hat and the smoke from the cigarette curled in his right hand catches in the light. A bottle of hard liquor is perched next to him on the ground, slightly concealed by an angular concrete block. Click the image to hear the corresponding audio file. Photograph 2: An old man clasps a cigarette in his wizened mouth, below his salt and pepper mustache. He wears a bucket hat and a worn polo. His eyes are closed. Click the image to hear the corresponding audio file. 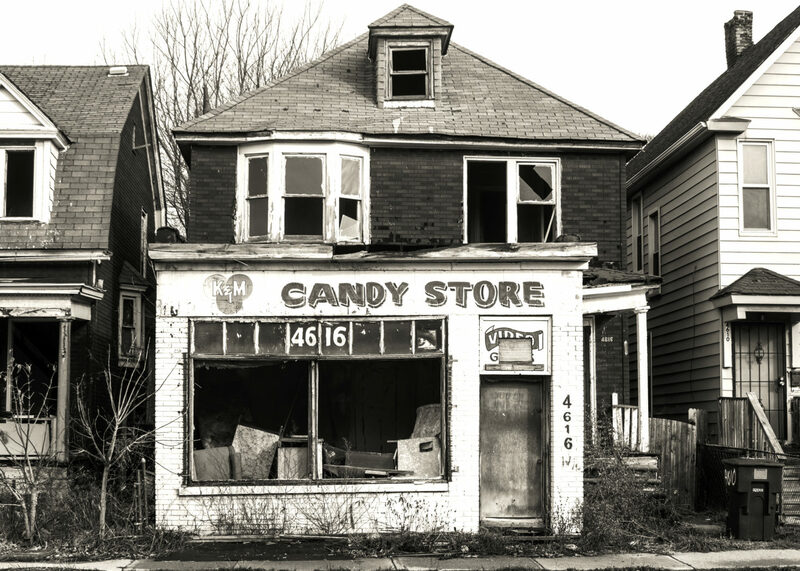 Photograph 3: An old, closed-down, shuttered candy store. A clutter of old boxes and furniture appear through the gaping window. Click the image to hear the corresponding audio file. Photograph 4: A man in a knit cap, denim jacket and hoodie looks at the camera with a steady gaze. Click the image to hear the corresponding audio file. 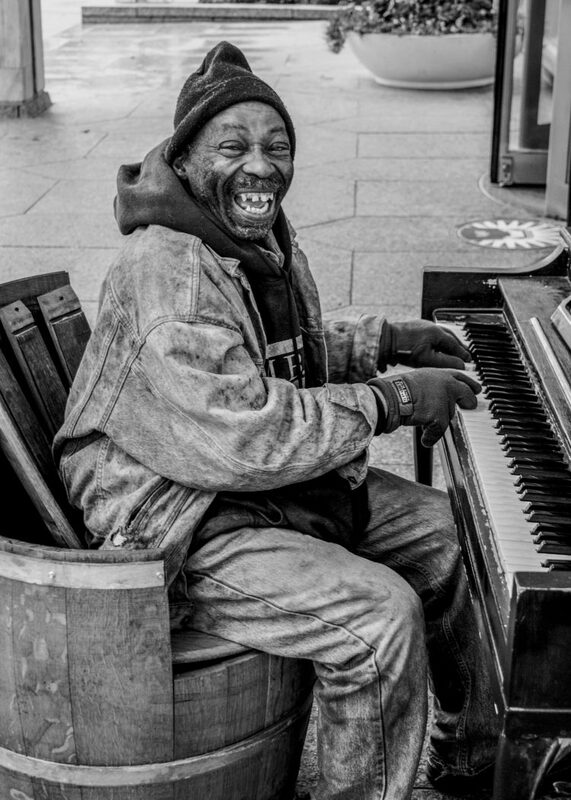 Photo 5: The same man breaks into a toothy grin. The shot is farther away and reveals the piano he sits at, his gloved finger pressing into ivory keys. Click the image to hear the corresponding audio file. He’ll also be featured in two other shows in Michigan coming up in July and October this year.